Description: Spongebob is setting up a show with the help of Patrick, or should we say we must help Patrick do his job to save funds by guiding him in placing the boxes at the right place and cheering for him. 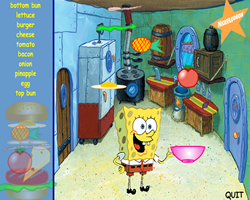 Move stuff out of Patrick's way by clicking on them and shaking your mouse in slimes and water. Good luck! Instruction: Arrow Keys - Move.